The giant creature rolls to one side and slowly lifts its tail, pain in its eyes. It gasps for air and finally falls back onto the deck. The morning fitness class at sea is demanding. We have decided not to take part in the usual transfer of weight from pantry to passenger, heeding axiomatic warnings of the inevitable 5 kilogramme minimum gain on even a short cruise. So, early mornings, we religiously fall to our knees with a soupçon of other worthies on gym mats, raising our limbs, stretching, heaving and ‘planking’ — a term I had previously assumed only related to torture. In some ways, I was not wrong. Unlike its larger sister ship Silver Spirit, the more intimate Silver Wind lacks a large group exercise area, so we usually find ourselves on-stage in the show lounge, accompanied only by a sweat band. Here, the Hungarian fitness instructor, Tamas Nagy, coaxes us with good humour but a firm hand to defy gravity and ‘swell’, in order to minimise collateral damage from the previous day’s menus. 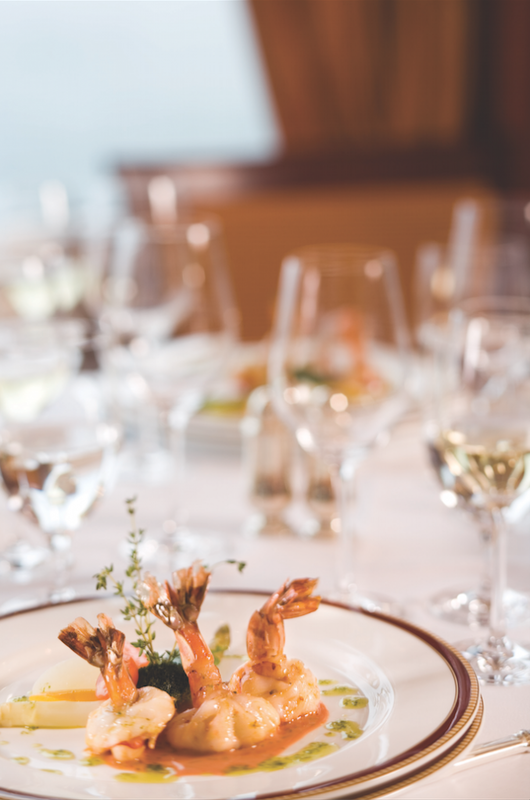 It is only fair to acknowledge that those very same menus offered a vast range of healthy options, and as the cruise is through Asia, much of the food on offer actually promises healthful freshness — but there are other temptations as well. Aside from being sprung returning from a night out with the crew in one port, Tamas seems the model of healthy cruising. In fact, he had probably been drinking herbal tea at a nightclub. The earnest powerhouse works out late each night, and works us out (almost) every morning at 7.30am. 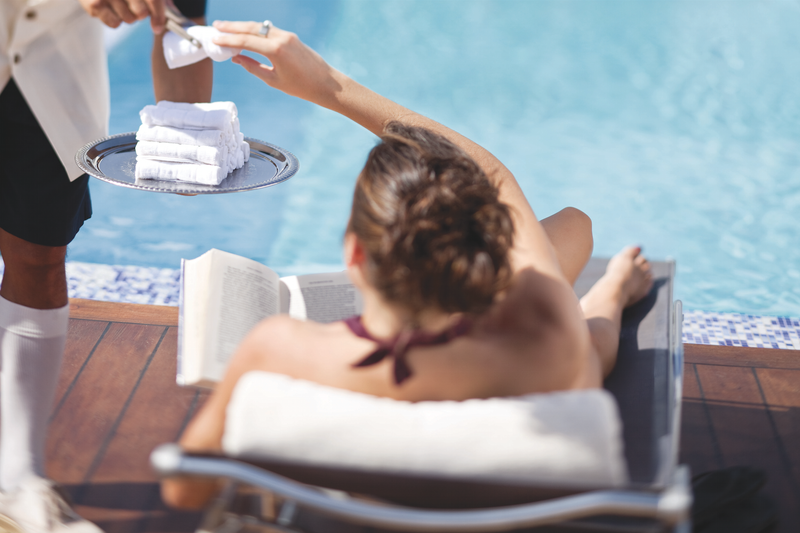 “I know a few guests who look at the gym before they choose the ship,” says Tamas, “but that’s maybe just five per cent.” Having spare time every day is a luxury that cruising imparts, so even fitness falls easily into place. Giving information about movement and the body motivates guests to continue working out when they get home, says Tamas — although the still-wrapped exercise mats at home beside the next cruise brochure would beg to differ. “How on earth will you manage without a butler when you return home?” asks the 80-page pre-cruise document. Our aide is named Mustofa. He is the endangered species of the long-tailed butler who ensures our fridge is always stocked with potions of choice — even anticipating the ullage which can autonomically drain a Champagne bottle overnight. His accomplice is a diminutive, ever-cheerful steward who, at the latch-click of a door, and with cat-like tread, emerges from the shadows, intent on tidying the slightest un-parallel pair of shoes in the sneak-in wardrobe. Much to our delight, neither of them torture towels into animals. Silversea cruises are all-inclusive, so the anomalous behaviour of sparkling fluid is not entirely unexpected by Mustofa. Tamas, however, has little sympathy for the repercussions of moral flacidity, steadily increasing the difficulty of our morning exercises. “I try to be gentle,” he smiles benignly.Even in the early morning when everyone else has fallen foul of full-fathom-five-metre swells for three relentless days, he is unremitting. “Hands under your bot-term,” he croons, “now push.” Just reaching the bot-term is hard enough. What drives a socially pleasant young man to pursue such antisocial aspirations? Part of it seems a genuine desire to help guests gain some control over their otherwise loose lives. “Just look in the mirror. Whom would you like to see? The person who is controlled by their environment, or the one who controls their environment?” I think he is referring to my previous night’s encounter with Mistress Soufflé. Tamas gets the chance to observe all 296 passengers as they board, while handing out cool towels. At that point I am more concerned about the person who is waiting to remove my half-enjoyed glass of welcome bubbly, stationed about three steps away from the person who offers it. Either I drink too slowly, or walk too fast, or many of the passengers move like clockwork — the small, not the second hand. Few people seem stressed on boarding, observes Tamas, and they are mostly older. “What I see is really positive; they know how to handle emotions.” Between 5-10 per cent use the gym regularly, he estimates, and that changes with the voyage programme: more sea days means more attendance. “Many times, ladies and gentlemen, even in their 70s and 80s, surprise me a lot by exercising two hours a day. In my country I cannot imagine someone of this age making a plank position.” Perhaps, at sea, walking the plank is now done in the gym. Our acquaintance with Mustofa begins as soon as we are shown to our stateroom. With a swish of his tails he presents a tray of toiletries with prestidigitatious panache so that one can select a brand to suit their skin, or eschew scents for sustainability. Then comes the Heidsieck Dry Monopole for celebration, the beer for hot days, the gin for sunsets, and the fridge for everything. I can see a cataract clouding the horizon of my health epiphany. Mustofa’s offer to unpack our luggage is declined, being a little too Downton Abbey; the ships’ Singapore slings are cast off and the novelty of never paying at the bar begins to dawn on us as we ‘shout’ new-found friends. Small ship cruising is for those whose daily lives contain quite enough excitement. The verandah door closed, the calm sea wafts by almost silently — with just the barest whisper of surf, and the irridescent navy blue of the South China Sea with a gloss sheen, like a spilled can of acrylic paint. The sea is 29 degrees Celsius and just 50 metres deep. The 99 per cent humidity is initially enough to keep me on the cool side of the glass, but watching the energetic voices of Silversea playing pool volleyball tempts many to brave the elements, which are switched to the ‘boil’ setting. Unfortunately temptation creeps from its locker in many forms, often obscuring low calorie options on the Silver Wind’s ample menus — underlining foie gras, emboldening cocktails and fattening faces of all types. A half-hearted attempt to hide the Relais & Châteaux French restaurant, Le Champagne, in the bowels of the vessel, and the feeble disincentive of a $40 surcharge fail to deter me from putting temptation firmly on my plate. Caviar is followed by foie gras, there’s porcini and truffle, and a Turkish waiter named Tayfun, “pronounced like the natural disaster.” The description is better applied to the soufflé unfortunately, but the formal evening is a memorable entrée to Thailand. The tide in Bangkok’s Chao Praya River has flushed the city’s stinking waste to sea, the breeze changes, and suddenly outdoor dining becomes tenable. We choose La Terrazze, with a table facing the weighty backside of the Uni-Angel cargo ship and a hazy view downriver. Opera plays,waiters subordinate their anticipation of one night in Bangkok to give great service, and homemade pasta, good wines and excellent cheeses contrast with the river’s weirdly industrial setting. The following day, on the national holiday of King Bhumibol’s birthday and Fathers’ Day, we have an early tour, which provides a good example of the benefit of organised tours in unfamiliar cultures. Prices are at the upper edge of reasonable, but personable local guides add candid insights and good value advice on avoiding tourist gouging. There is safe bottled water (some can be counterfeit), help for the infirm, and a guarantee that the ship will wait — which it might not if a private tuk-tuk encounters a flat tyre or is snared in a Bangkok traffic jam. On this celebration day, wearing yellow is encouraged, a colour meaning ‘the middle way’ and non-conflict in the Buddhist world. It seems that every clothing maker has a yellow range. Our tour takes us on a shallow longboat up the Chao Praya. To my amazement the turbid waters are teaming with koi carp, while temples are awash with mostly Asian tourists. The Temple of Dawn (Wat Arrun) offers a climbing challenge, rewarded with city views. On closer inspection, the 17th century Buddhist temple is decorated with flowers and patterns made from broken plates and ceramics — an example of early Khmer recycling perhaps. The flower markets are busy with locals buying offerings for fathers, and across three or four generations, men and women are peeling petals on Lotus blossoms, creating arrangements wrapped in plastic, and preening yellow garlands. A free food stall offers rice and curry for the needy, and smiles abound. There are no beggars; a welcome and unexpected contrast with my home city of Auckland. Travelling further up-river, smelly spume from the longboat prow splashes us like dragon spit, while other boats speed across our path and water buses wallow with yellow-clad crowds carried from tenement to temple. Back onboard Silver Wind, the business of the port clanks on, with cranes, hoppers, buckets and barges banging and booming even louder than the 21-canon salute from the royal palace. I wonder if, like the boy Buddha, the royal family has conducted pilgrimages into the poverty, hunger and squalor outside the palace gates. We certainly see much evidence, but we also see few faces without smiles, even on people living in dereliction. Good morning, Vietnam. The film starring Robin Williams portrays the western view of the Vietnam War. Here, it is called the American War. The four hour cruise up the murky Saigon River brings home the industrial and polluted nature of Indochina today. We tie up less than a kilometre from the city at the main dock and as the evening merges with night a function centre with one very loud outdoor sound system hosts a wedding. Our dinner on the aft deck is a mixture of Italian opera and head-banging funk, while tropical downpours come and go, and LED-coated skyscrapers present a sparkling light show. Twinkling dinner cruises pass on the turbid river as we dine on delicious, but physically dislocated, Italian slow food. New Zealand sauvignon blanc completes the sensual assault. The next day we (rather unnecessarily) follow the advice of some lads who have stayed ashore in a hotel and take lunch at an excellent, upmarket Vietnamese restaurant. While our very tasty feast for two cost NZ$30, we could also have filled up near the markets with a large bowl of pho, or noodle soup for NZ$3. This is not my first visit to Ho Chi Minh City, but it remains impossible for me to hear and see the history of Vietnam without getting tearful. The people will never forget the war and oppression, yet they seem to have inherent forgiveness beyond my comprehension. The French occupation of a hundred years imposed ignorance and illiteracy as part of its severe regime, and the American War was a failed and horrid crime of misunderstanding and brutality — as is apparent from confessions by former White House and Pentagon chiefs. Seeing the three buildings where the CIA evacuated Americans by helicopter as Saigon finally slipped from their grasp brings back evocative images from the musical Miss Saigon. I also remember a visit back in 1990, when a young Vietnamese man took me to a local restaurant on the back of his Honda (every make of motorcycle from a Vespa to a Harley is called ‘Honda’ here). We had snake — python if I recall — which was beheaded at the table, and we drank its blood for good health, the heart still beating in the glass. My host insisted on paying for our serpent dinner with his paltry wages, my first awakening to Vietnamese generosity and hospitality. A family growing rice may make only three hundred US dollars for the year’s harvest — before costs — but even amid poverty, that warmth still shines. As we uncoil our way down the Saigon River, the city skyscape moves from port to starboard and back again — a chaotic panorama of towers that were totally absent some seven years previously. Force six winds and rough seas await as Silver Wind passes a huge hillside statue of Christ. The ship comes about to follow the east coast up to Nha Trang and overnight the winds breach 70 kilometres per hour, while the waves toss and turn many trying to sleep. Little surprise that the morning abs class becomes a one-on-one session. Warming up on a treadmill, I gaze out at Nha Trang and CNN warns that an ex-tropical cyclone is on track directly for… Nha Trang. Cabin attendants have already placed makeup mirrors on cabin floors, and the pool is being drained as I check my Nausicalm tablet and gin supply. The ship’s hygiene programme suddenly becomes much more overt as antiseptic sprays replace polish, and that evening is rather dismal as the mounting seas spread sleep deficit among guests and crew alike. Even on the previous night, a stage-side Christmas tree had been swaying alarmingly, threatening to project its coloured baubles into the audience, and tonight the show is cancelled. Outdoor tables are huddled in a stack and ginger is being handed out as a calming palliative. On this dark and stormy night, many passengers turn a delicate shade of sea-green and stow themselves in their staterooms, but I go in search of something simple for dinner. The problem is that the night had been designated ‘formal’. Without a jacket and tie, I would be refused even a leaf in the main dining room. “I had 62 diners, now I have just 42,” rues Sergio, the maitre d’ from Madeira. The poolside grill, usually a refuge for those disinclined to dress, is closed due to the elements. Room service is not possible and my roommate is recumbent in the dark with mal de mer a little too close for comfort. So I stagger into my finery and face the bucking decks in order to be fed. It is surreal — the empty corridors, restaurants with more staff than guests, entertainment silenced — and yet there I am, striding along, with the odd involuntary leap and wall-crash, almost as unscathed as Bruce Willis in a Die Hard movie. 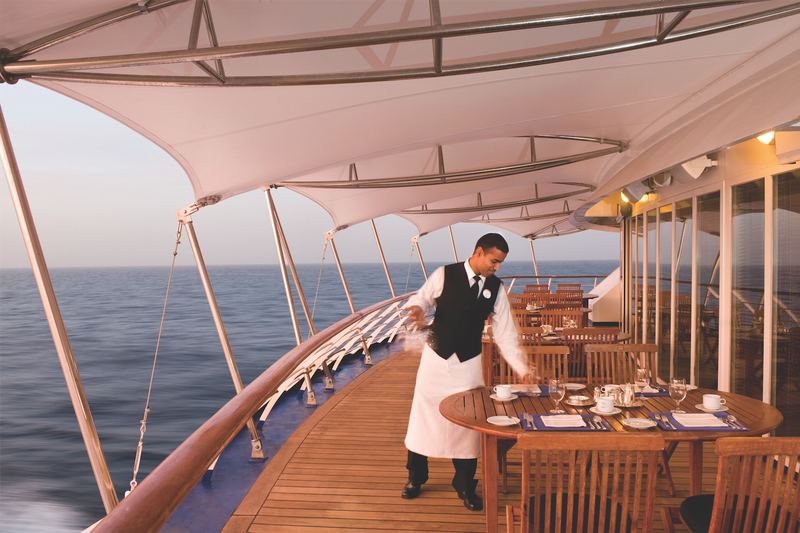 Next evening, as we set sail for Hong Kong, we look forward to dining under the stars and a poolside cabaret. However, the waves now spraying up to Deck 7 and the lack of stars put paid to plans. Somehow the chefs still manage to turn out excellent food for the reduced numbers dining. With seasick tablets being handed out like confetti, more people emerge to dine, but this is clearly not an enjoyable ending to the cruise for many. A sleepless night follows, with creaking panels and the bow crashing down from the top of the waves, creating an effect like someone lifting the end of the bed and dropping it to the ground every minute. The next morning, the Stretch and Surrender class is cancelled, and Mustofa is disappointed to see there was no need to replenish the Champagne supply in our suite. After the first day or so of bingeing at the all-inclusive bar, consumption naturally drops. For a teetotaller, the cruise price of a non-inclusive ship may be thriftier, but for wine lovers, my guess is that it comes out near even. There’s also the absence of expensive gratuities. 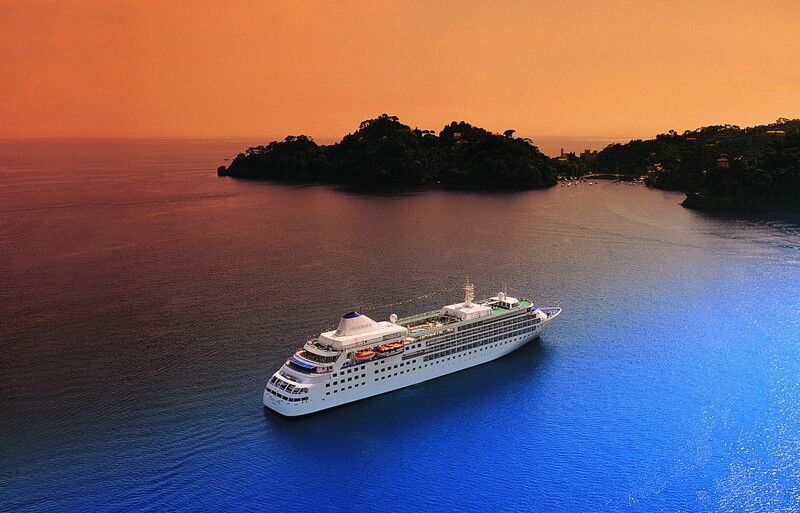 Most passengers I meet prefer the inclusive cruises. 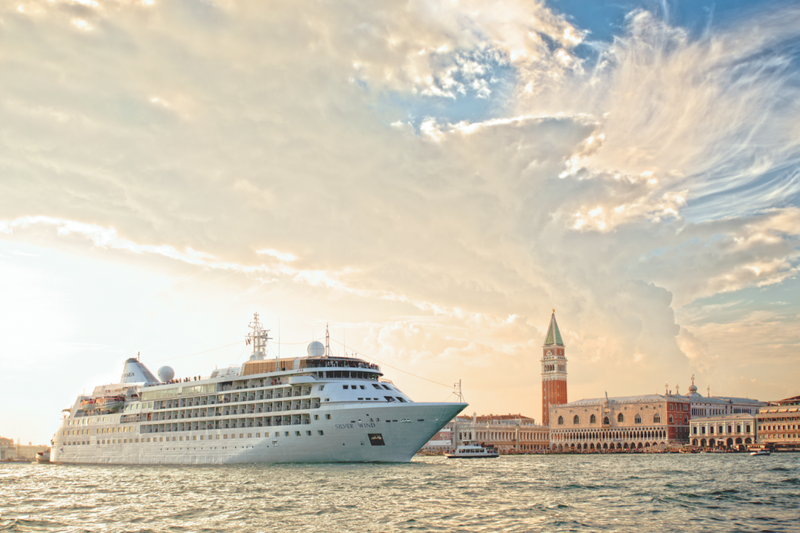 Silversea is presently experimenting with including Wi-Fi and those budget-breaking excursions. However, passengers who have done both types of cruise are clear on something more significant than cost: an all-inclusive ship is more socially lubricated. Inviting Mrs Diamond and Mr Oilwell to share champagne, or dinner, with no bills amassing, nor the spectre of expensive reciprocity can liberate relationships. As Captain Failla comments, inviting others to dine carries no obligation. As I raise my gaze beyond the glass to the glacier-blue wake fading out to the horizon, the best part of a cruise becomes quite clear. It is the admission to a more graceful and predictable little world. In few other places can I be waited upon and meet people whose stories are straight from the upper deck of the Titanic. The food, and even the now-failed fitness fix, place me in a new kingdom where frogs mix with princes and a Dior has no more real status than a cheap strappy number. An all-inclusive cruise is the ultimate leveller. However, most of all, it is what that wake symbolises. Everything we have done is behind us. Guilt and regret go overboard, unrequited ambitions are in the hands of the bar person, the valet on vacation has class equal to the millionaire, and business dealings flicker into the vicissitudes of the marine internet. For just a few days, what lies ahead is beyond our construction. In the words of Buddha, all is impermanent. How thrilling. How liberating for the spirit. Here’s to cruise control.